It weighs half as much as a sports car, has four wheels that turn independently, each with its own built-in electric motor and set of batteries and turns on a dime—so its no surprise that the electric car being developed at Ohio State University needs an exceptional traction and motion control system to keep it on the road. In a paper in the January 2013 issue of the journal Control Engineering Practice, his team described the car’s ability to follow a specific trajectory. In tests on good road conditions at the Transportation Research Center in East Liberty, Ohio, the car followed a driver’s desired path within four inches (10 cm). To test slippery road conditions, the researchers took the car to an empty west campus parking lot on a snowy day. There, the car maneuvered with an accuracy of up to eight inches (20 cm), and the vehicle traction and motion control system prevented “fishtailing” through independent control of the left and right sides of the car. The experimental car also weighs half as much as a conventional car—only 800 kg, or a little over 1,750 pounds—because it contains no engine, no transmission, and no differential. 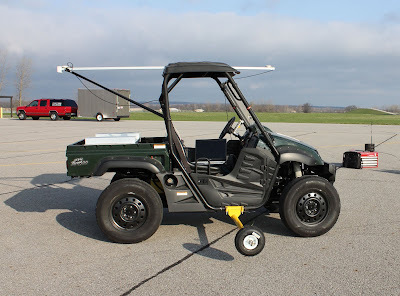 The researchers took a commercially available sport utility vehicle chassis and removed all those parts, and added a 7.5 kW electric motor to each wheel and a 15 kW lithium-ion battery pack. The wheel motors are controlled by a central computer. In fact, a driver who is accustomed to conventional cars would have a difficult time driving a car of this experimental design, known as a “four-wheel independently actuated” (FIWA) car without the help of the vehicle motion and traction control system. With its ability to turn sharply and change direction very quickly, the car could be hard to control. Wang has tried it. “Without the controller, it’s very hard to drive. With the controller, it’s quite nice—quiet, and better control than commercial four-wheel drive,” he said. The main challenge for his team—which consists of bachelor’s, master’s, and doctoral students as well as a few local high school students—is to make the whole traction and motion control system energy-efficient and fault-tolerant, so if one wheel, motor or brake malfunctions, the others can compensate for it and maintain safety. It’s a situation analogous to a multi-engine plane losing an engine: the other engines have to adjust thrust and angle to keep the plane safe and on course. Future work will concern the FIWA car’s energy efficiency for increasing its travel range in urban environments, and optimizing the weight distribution in the car. Wang estimates that we won’t see a FIWA car on the road for another 5-10 years, as researchers continue to develop new algorithms to control the car more efficiently and add more safety features.